As a gateway to the world, Hamburg is always worth a visit. Enjoy our hospitality for an unforgettable stay in the most beautiful city in the world. 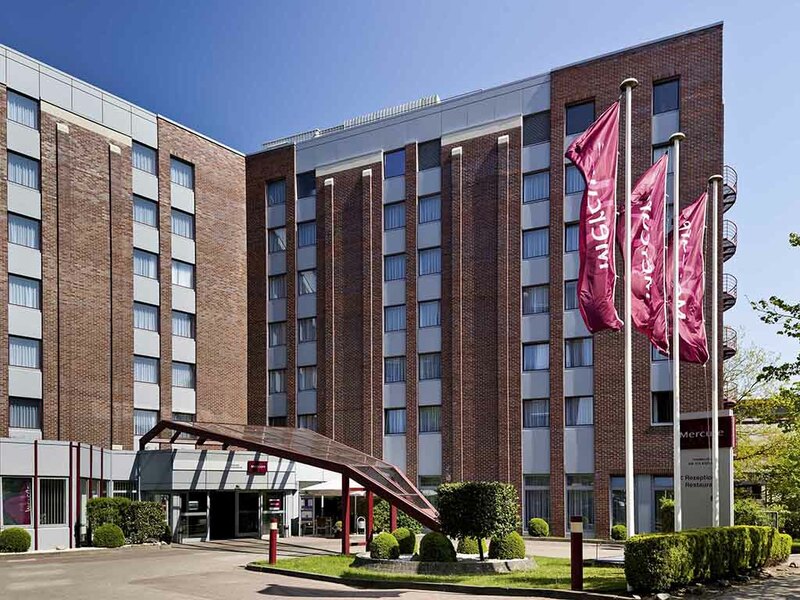 The 4-star Mercure Hotel Hamburg-Volkspark is in west Hamburg near Bahrenfeld race track close to Volksparkstadion (HSV) and the Barclaycard Arena. It has best links to the in-quarter of Altona, Derby Park, city centre, Hafencity, and A7 freeway. The hotel has 140 air-conditioned rooms with free Wi-Fi, underground car park and parking lot. There are 3 meeting rooms for events with up to 120 participants. Relax at the Volkspark, VAF sports facility or on a rental bike (May-Oct.). For a comfortable stay at the fully air-conditioned 4-star Mercure Hotel Hamburg am Volkspark, we offer 128 Standard Rooms. We also have 12 spacious Privilege Suites available to satisfy greater requirements, which we especially recommend for family stays. One child aged up to 16 years may stay overnight free of charge (including breakfast) in his parents' room. Pets are welcome upon request at a charge of EUR 15/night, depending on availability. All rooms have free WIFI. Sample the culinary delights of the North: Enjoy regional delicacies with a modern twist, along with international dishes and the excellent Grands Vins Mercure. All staying true to the motto of traditional, regional and fresh. Sip a refreshing drink or enjoy a range of bar snacks (until 11pm) and talk to other guests at the hotel while watching live sports events on TV in the bar, which is open daily from 5pm to 1am. Good hotel with bad receptionists! No understanding of the receptionists for basic requirements; I was waked up at arrival day just because they needed again the already given credit card data; I had to pay 10€/day extra for the second person in the room because I forgot to do it at the first time of booking (even being an Accor member); even if the hotel was not completely booked at our arrival time we didn't received a room for an earlier check-in, even if we required it as we arrived after an 8 hours exhausting trip. Hotel is not bad but the attitude of some receptionists is unacceptable and ruined the stay! The Barclaycard Arena can be reached by foot. The Hotel is nice, clean and calm. We did not order Breakfast because it is too expensive. The city center needs to be reached by car. There are not many options for lunch/dinner arround the Hotel. Key issues: lift waiting time extremely long. No fridge/freezers in rooms, not even ice machines on any floors. Gym and pool out of order for “years” now. Breakfast far too expensive at €18. * Severe problems sorting out the invoice. * Prices are not transparent. When I came back, I learned that my college (Asbjørn Busk) had paid less for a single room from Sunday September 30th to Monday October 1st - and I am member of the Accor club and should have the best prices..* Glass door in the shower was defect and resulted in a flooded floor. * Breakfast table was short of quite a lot of items already at 9 o'clock . Stayed here several times due to location. Rooms need a fridge/freezer and/or ice machines on each floor. Shower in bath should be better as water is sprayed everywhere and the floors are flooded. Elevator far too slow when calling to other than ground floor/reception taking sometime more than 2 minutes to arrive at first floor - off peak times. Breakfast ridiculously expensive at €18 and then there is often a queue for coffee. Meal menu very limited. Stairs not easy to find. We chose this hotel as parking was free and it was not far from the City Centre. Very friendly and helpful staff and good quality rooms. Had an excellent restaurant at fair prices. Would stay here again. Since leisure offers like sauna and pool are our basic requirements when choosing a hotel, I would have expected to be informed at the time of our booking that those features are NOT available. An additional service included the possibility to be provided with an iron and an iron board. When asking for it, it took 1 hour to only get the response that no irons and iron boards were available. No other solution was provided. Very dissatisfying if one has to attend a very formal meeting with a shirt which is crumbled.... The housekeeping entering the room at 09.00 am on a Sunday, TWICE! Very rigid NON-out-of-the-box thinking of staff which prevents a satisfying customer experience. For an internationally operating hotel chain an absolute no-go to remain competitive. We stayed for a long weekend at the Mercure Hotel in Hamburg by the Volkspark. Very well located, easy to access highways and easy to get to the center and stil out of the party area. Parking below in the garage was a big plus. Breakfast was very good. Very nice staff. The only thing we could complain about would be the sleeping sofa that folds out. Not very comfortable and we had to take turns due to how hard it was. That we have seen better at other hotels. Overall a very good experience and we would surely come back, next time we stay in Hamburg. The hotel was easy to find and the room was very nice and clean. Unfortunate the breakfast was to expensive, so we didn't order that. It was a nice experience, I always choose this hotel when travelling on a business trip. It is really close to work. this place can be improved significantly. it is not a good idea to take your family of two adults and one child.. the room sizes are small.. as a gold member i was not upgraded but i was provided with a lettter that states as a gold member you are eligible for n upgrade.. I requested for a room with two single beds, and even though at the beginning it looked impossible, the hotel surprised me with meeting my earlier request. I was also checked in earlier that the standard hours. The meals for a dinner in the restaurant were also great! We have stayed twice at this hotel and been very sagisfird both times. The staff is friendly and the food in the restsurant excellent noth for breakfast and dinner. It is very easy to park direct outside the entrance or in the underground garage. Booked one night for the Stones concert. Not a lot of choice for 3 adults at this time and expensive due to the concert I assume. Room was spacious but only 2 cups for 3 people and could have been more pillows available. Was particularly surprised that the 'fluffy bath robe' was completely threadbare. Not suitable for a four star hotel at all. Also I asked twice when booking and by email for advice on how to get to the hotel and to the concert but got no reply at all. Location not central but on good bus route. I stayed here for one month. In comparison to similar hotels at equivalent price level, I would say this hotel is very well appointed with many good features. The room is spatious. The bath is large and well planned. The hotel staff are willing to accommodate and find ways to meet your cular requests. The restaurant is quite good. I dined there several nights. The waiting staff are also very professional. I rate this hotel very favorably. As said in the short sentence before, my experience has definitely been positive starting from the kindness of the desk clerks also being very helpful and informative, the cleanliness of the room, the free wi-fi connection, the restaurant, the huge variety of choice for the breakfast and last but not least the possibility of depositing the luggage for long hours. Very nice and modern hotel, close to where I had business meetings. I really liked the spacious room, nice bathroom but most of all the allergy free bed linens. Hotel with free parking. Rooms and service are good. Inhouse pool is under construction and wifi network access (also for premium package 6 Euro/day) with no or very poor / limited connectivity. And if you are traveling with three teenagers (like we did) these are very important criterias. Restaurant food and service very good, better than expected. Housekeeping not so good, shampoos and coffee not replaced everyday. Fridge in the rooms would be better or at least an ice bucket with ice machines on each floor should be available. Otherwise, good experience.